Welcome to the November 15th edition of Warehouse & Logistics News. When it comes to proving their quality credentials the warehouse equipment and logistics services providers in various sectors are taking the initiative and setting their own standards. It’s a welcome trend, protecting end users from unscrupulous suppliers offering lower priced equipment of uncertain quality. 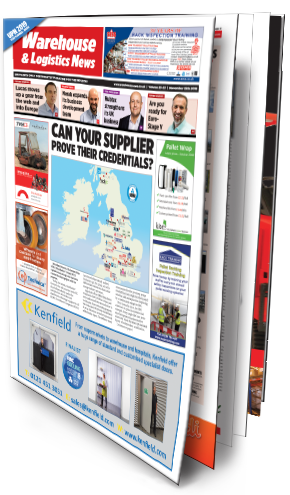 On our front cover, Jonathan Bennett, Chairman of the SEMA Distributors’ Group (SDG) explains how storage equipment end-users can ensure that their storage project is fit for purpose, with three-yearly appraisals of the distributor companies concerned. The latest assessments for the 30-strong SDG group reveal that every single member passed scrutiny, with average scores improving steadily. In our Loading Bay feature another UK trade body, the Association of Loading and Elevating Equipment Manufacturers (ALEM) can offer guidance on loading equipment quality. In the same feature Thorworld have provided mobile loading platforms to Robert Scott, the cleaning product manufacturer. As winter takes hold, thermally efficient loading bay doors become even more important. Also covered in this feature, Sara LBS has installed new high-speed roller doors at a bus chassis works in Lancashire to help them retain heat and reduce energy bills. In our Motive Power feature Calor has impeccable credentials as the leading supplier of LPG and LNG fuels. The consultation on the government’s Clean Air Strategy has officially closed but Calor are now calling for the government to consult the freight and haulage industry end users fully, to make the transition to cleaner vehicle technologies as simple and cost-effective as possible. Meanwhile diesel and LPG forklifts users will find life getting tougher from January 1st 2019, when the new Euro Stage V comes into force and new diesel and LPG forklifts sold in the EU have to comply with the toughest emission standards for non-road vehicles. When it comes to complying with measuring and weighing standards, express freight operators and freight forwarders who charge customers by the size and weight of their loads must use equipment deemed legal for trade, or risk losing their ISO certification, if they have one. Profiled in our product news section, Avery Weigh-Tronix’s Revenue Protection Solution is the only trade-approved mobile weighing and dimensioning system on the market and means all freight can be checked as part of a standard process, with no standing time. And finally, don’t forget to check out the 2019 UPNsponsored wall planner, included free inside this issue.